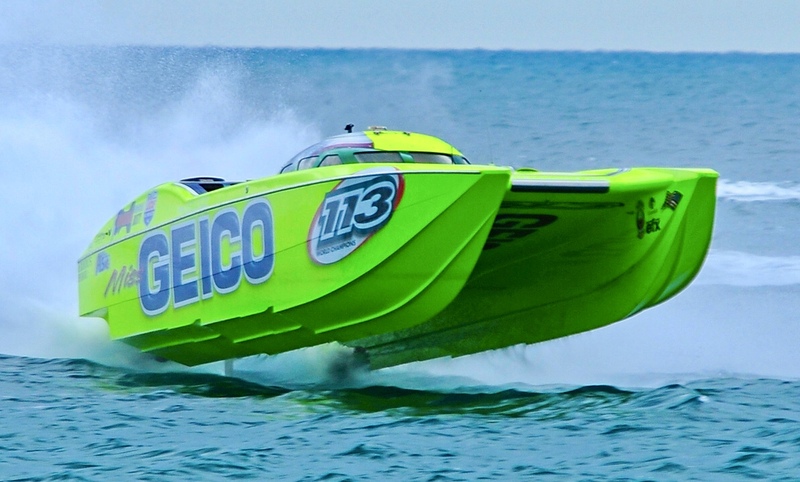 Home Powerboating News OPA: Miss GEICO secures the World Championship Title! OPA: Miss GEICO secures the World Championship Title! In what is expected to be the last race of the unlimited horsepower class, the final day and final race of the OPA World Championships in Englewood, FL, #113 Miss Geico Racing, throttled by Steve Curtis and driven by James Sheppard enjoyed a huge lead for most of the race and finished in first place, followed by #7 Team CRC/Spooled Up with owner/driver Mike DeFrees and Jay Muller on the sticks. Following close behind were #11 Stotler Turbo and #18 CT Marine. Rookie Team AMH Motorsports left the contest early due to mechanical issues and returned to the pits. With its second first-place finish in both consecutive days of racing, the GEICO team has unofficially won the OPA World Championship title for 2018. Congratulations to all of the teams on an outstanding weekend of exciting racing!